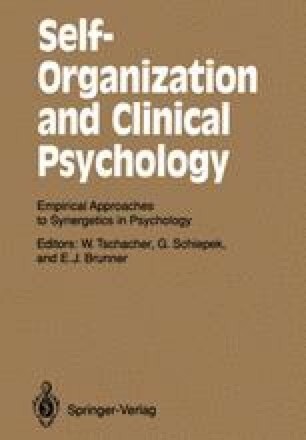 This article outlines a synergetic model of self-organizational processes in psychotherapy. Following a short introduction, the fundamental conditions required for self-organization to occur are indicated. The therapeutic process is described in terms of the interaction between the client’s lifestyle scenario, the therapeutic system and the context of therapy. The aim of therapy is to deform the potential landscape created by the client’s lifestyle and to amplify the fluctuations in the behavior of the client system. The third section demonstrates how a concrete therapeutic approach, that of the Brief Family Therapy Center (Milwaukee, USA), can be interpreted using the concept of synergetic self-organization. The fourth section presents empirical methods which allow the description of change in the lifestyle scenario and the therapeutic system.